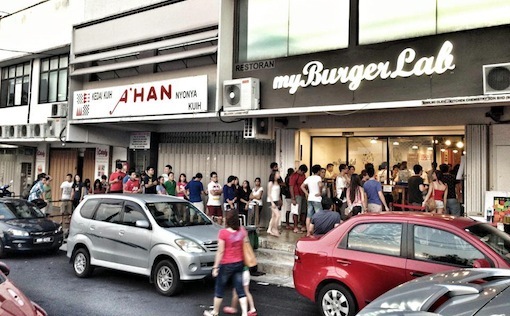 And just like that, 4 years have passed, since the day we embarked on an idea from Renyi’s home, to testing our burgers with friends at the Red Bean Bag, to now what we have at 4 locations in Klang Valley. Sometimes I do wonder how everything just happen, cause it just feels like yesterday that we were just talking about the idea. There were so much emotions that come and go throughout the journey that makes it even more surreal. The whole 4 years did feel like a degree sort of, a degree which is cheaper than my actual education degree actually, which has taught me so much, especially in the year 2015 as it was the toughest year ever. It was as if I was going through a FYP/Thesis phase for my final year. It’s been a while since I last wrote about our journey. The emotions, growth, self reflection and friendships that have occurred over the years have fueled me to write about this 4 series article, due to release every weekend till our Anniversary week, July 10. Many of these things have not covered by any media and it’s about us opening up on our vulnerability to the world to see what are the things that goes behind that black burger joint. Many thanks to the people who were part of my life over the years. Thanks to my family for continuing trusting me, the myBurgerLab team to give their all hustling through a roller coaster ride, my myBurgerLab partners for believing in the journey and hustling non stop, the customers for the continue trust in us with their returning visits, my Ops Ninja partner and team, my budding entrepreneur friends (your presence itself is a good reminder for me to hustle) and my friend Li Kheng who supported me spiritually since I knew her. Throughout these 4 years, we went through from selling 600 burgers a day to facing a decision on whether to call it a day for the business. We went through few fundraising talks but all didn’t happen in the end. We took risk to work with someone abroad to open our Cambodia location which we learnt a lot with working with someone else. We lost staff along the way, some which we should have fired faster and some was we over hired. We had to reshuffle roles and responsibilities many times. We made so many friends along the way, many whom helped us one way or another, giving us advice and supporting us emotionally. And after such intense journey, I will be covering 9 things that I learnt along the way. Starting a business starts from the right mindset. Your why and conviction has to be strong and clear. Entrepreneurship they call it, is not something glamorous to began with. The media has worked its way to glamourize entrepreneurship that makes a lot of student contemplating on quitting their studies and jump into entrepreneurship. Awards, PR Release, News Coverage are good for business marketing, but it doesn’t guarantee personal success. We are just people who just wanna create things for the world and grow a bunch of people to serve the people of the world, teaching them to put others first. If someone wants to start a business because they say “at least I have something on my own”, or “I’m tired of working for people” or “I don’t like working at my place”, I will go like F**K you! That is because business is not a game of just try and see what happens. Being naive is a good firepower to have when you first venture into a business, but being able to focus on yourself first and not others will cause you burnout in the long run. The amount of responsibility you hold as an owner is large. So large that it involves other people’s life – your staff and their children, their family, their partners. Take this perspective into account where you look at your financial statement and worrying that you have to lay them off when you go into the office. It’s so mental torturing. Sometimes I will just feel ashamed to even go to work, but I know the 2 routes that exist are either downwards or just keep on trying to go upwards. We get paid last when it counts. There’s no security, no fixed schedule of 5 days work week, no benefits of public holiday and to sum everything else in a much worse state, we are not even building something that is ours, because we will never able to bring it to us in the grave. So why bother to take such a difficult route? If you ever want to start a business, please start with these questions. And it is through these hard times is when I finally understood why some people are just reluctant to start their own business. Some people’s lives will be made miserable if they venture into entrepreneurship. Honestly some people are just better off working. Many of my peers now are making even more than me in their monthly salary. The good thing is, through this difficult journey, it also helped me to evaluate a founder of another business sharper if I were to work with that person or invest in them. “What happens if this venture doesn’t work out”. When a seasoned businessperson goes through the hard times, that is when you truly understand that the only way out, is the person itself, and that is all that makes the difference. It is not the best years that count, it’s how you handle the bad times that counts. It’s no longer which idea is the best or whether this idea would change the world, but how much of grit do you have to just run a business successfully. It is true when top VCs in the States say that it is difficult to find someone that can qualify as both a founder and a CEO material at the same time, because both roles do require different set of emotions. End 2014, early 2015 was the toughest times of our lives, as we had to get some money to open our 3rd store to ensure our survival. It was either taking that risk to do one last push or end up losing everything (more explain in the Part III). During that struggle, the motivation to even go ahead for one last push was questionable. There were doubts on whether there could ever been a light at the end of the tunnel, despite thinking we have done the really best we can. From 18 months of having people to queue outside our first outlet to facing shutting down the business, it was a mental ping pong in my mind. I was really lost, struggling to pull myself out of bed sometimes. It’s depressing, that’s fact of life. You just don’t see it in the media. And through those difficult moments is when each of us would have to find our own source of motivation and for me, it was the people who trusted us to embarked on the journey at the beginning. There’s just too much sacrifice from their end for me to let them down. If it’s up to me to battle it out once again, it’s for the management team, the young energetic geeks and the customers. Who else could possibly do a burger joint with such creative burgers and such energetic service if it’s not us. If it’s meant to be, we should be the one who power through to leave a legacy and putting Malaysia on the map. 80% cut on my pay for 15 months, cut down on spending to buy time, working 18 hours a day, weird sleeping patterns, hustle to make more sales and started another business (Ops Ninja) with my other partner (Chok) to fund my living. When times get tough, you just have to do whatever it takes to just make it work. No negotiations, just whatever it takes (within the moral discipline of course). If there’s anything to blame, it’s to blame it on us ourselves as entrepreneurs. Throughout those difficult times, catering for Maxis management lunch saved us. Catering for Digi annual internal staff celebration saved us. Samsung Star Light Cinema events saved us. Many more events saved us and it is true that when people said “When you ask for a miracle, you may just get what you want after all.” The world does work in mysterious ways, and that is when I learn how to be grateful for what I have. I’m usually stress out over things, what more when the business was at such uncertain stage. But it was through the understanding what these 2 words “Acceptance” and “Impermanence” really mean that helped me to detach myself emotionally from the business. Acceptance – Being able to accept that whatever happens, happens for a reason and instead of resisting them, it’s all about accepting them and ask ourselves what’s next. Acceptance starts from giving the permission within to accept the situation and scenario. The more we resist, the more friction it creates and then there’s where paralysis happens. Impermanence – Nothing in the world is permanent. Look at Nokia. Look at the various banks worldwide, nothing will last forever and that is just the fact of life. It was the biggest breakthrough for me as I understood that the business success and failure doesn’t define me. This helped me to make my decision more objective instead of emotional ones. We are always faced the challenge of an entrepreneur to always take the emotions of our team into account, but sometimes we know better that we have to do what’s best for the business because through that, the business will in return be able to take care of the people. No matter how hard we try, it will not be ours forever. We are just given this duty from the universe to serve others during this lifetime. And it is through this difficult times that made me realized why so many of the successful people out there are so humble, because they have been through terrible times and they are just here to make other people’s life better. So start with the right mindset, a purpose, a why that is bigger than yourself because once you start a business it’s no longer about you. It’s about others. If you are in the working world, and wanna do your own thing, talk to your boss to see what you can help him to kick start with. There’s a new trend call Intrapreneur, and that is much better as you have at least some safety net. Some say birds of a feather flock together. Some say we attract what energy we portray – if we are positive, we will attract positive people. When you have the right mindset, your circle of people will usually have the similar wavelength of mindset. It’s true because over the years, I could see how my network of people grew, from budding startup friends to seasoned entrepreneurs. But both having the same purpose and mindset, just that they are in different stage of business. Hence when you are starting up your business and are looking for a founding partner, you will be able to attract the similar kind of people if you have the right mindset. After listening to so many stories of founders’ breakout over 4 years, I am seriously grateful to have my partners as my partners. Sometimes when people ask us what our success of myBurgerLab is, I don’t even know really because it’s a combination of so many different things, but sometimes I like to think that it starts from us having a good partnership which is honestly unexplainable. Many people have asked me before, should I have a partner? How is it like working with partners? People say 2 is hard to deal with already how do we go with 3? To be honest, if you can handle marriage or a relationship partner, you can definitely handle business partnership. It ain’t that bad really, in fact it’s much simpler because usually the bigger end goals and directions are clearer, it’s only the small little goals that builds up to the bigger goal along the way that has its own challenges. Having partners and no partners have no right and wrong, it’s just both have different consequences and it’s how we perceive each choice to be. When you have no partners, it just means that you have find really good people for your team to complement what skill sets or mindset that you do not have. More importantly also to find good hire for your team that can cover you when you are sick or unavailable or to hedge on the risk on the continuity of the business. The good part of having no partner is the simplicity it can create for your team in terms of directions and culture, as they don’t have to be stuck in the struggle of partners to make a decision. Sometimes that could cripple the speed of taking action in an organization. When you have partners, it could create more conflict but also it helps to keep each other in check. Having partners is good to complement each other and with that, together everyone could achieve more things going forward. The key is how do we turn the conflict into a resolution that is for a bigger purpose, which in our case is what would make customers happy and have a better experience. If it serves that, personal agenda will immediately be nullify, because customers at the end of the day are our boss, not us. They pay our bills. Both my business in myBurgerLab and Ops Ninja doesn’t have full length partnership agreement kinda thing, and I think that’s because of our trust towards each other that somehow we just don’t see the need to. And that sometimes is what they say the best partnership is, people who can work with each other naturally without much black and white terms. I have always like what one of my favourite entrepreneur, Tan Thiam Hock, shared about his partnership history with his late partner Mr. Ang in his first few ventures. It just shows trust is the most valuable thing over any fees that you pay to the lawyers to prepare an agreement. From my own experience, if your partnership gonna involve 2 people, then best to have one handle operations and the other to handle business development + marketing. Cause these 2 are the main core of early stages of the business. If you can’t handle accounts, get someone else to do it. Having more money in the bank is more important than recording money in the bank. Go out and be a hunter. One piece of advice I could give though is to find partners who share the same kind of values. Having similar life values would really help. The only caution I would have for having multiple partners is how it can affect the culture of the company, which I will continue in next week’s column. Till then, this marks the end of Part I.